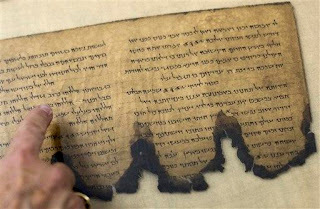 The Dead Sea Scrolls are a collection of ancient, mostly Hebrew manuscripts that were found at several sites on the northwest shore of the Dead Sea. Between 825 and 870 different scrolls have been found in 11 caves from 1947 to 1956. Most of the texts are biblical and include fragments of every book of the Old Testament except the book of Esther as well as the earliest known Book of Isaiah and never before seen psalms attributed to King David and Joshua. Some non biblical texts were found as well, and are commentaries on the Old Testament, rule books of the community, war conduct, hymnic compositions and benedictions to name a few. The Scrolls are believed to be the library of a Jewish Sect, written by the Essenes and hidden in the caves around the First Jewish Revolt (66-70 AD). The discovery of the Dead Sea Scrolls is widely considered the greatest manuscript find of all time. The scrolls predate the next oldest Old Testament manuscript by 1000 years and prove that Christianity was rooted in Judaism. They also give us a clear insight into Jewish life at the time.